F.C. Barcelona 2018/19 Nike kits for Dream League Soccer 2019, and the package includes complete with home kits, away and third. All Goalkeeper kits are also included. This kits also can use in First Touch Soccer 2015 (FTS15). 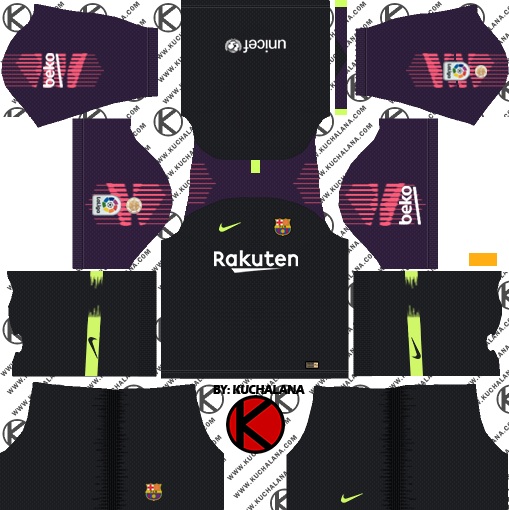 This kit broad to you by Kuchalana.com. Barcelona and Nike has just launched the new kit Barcelona house from 18 to 19 with an event at the iconic Olympic swimming facilities Montjuïc in 1992. Barca debut with his new kit in the last game of the season against Deportivo which will also be the last appearance from Andres Iniesta to the club. 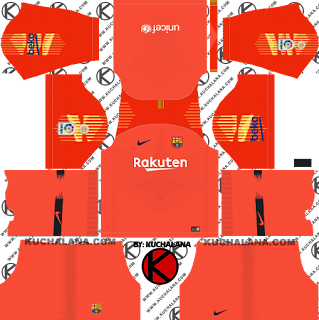 The new Barcelona shirt will be available for purchase from May 21. Produced by Nike, the shirt of the Barcelona 2018-2019 house presents a new look with fine blue and red stripes. In fact, there are exactly 10 red stripes on the blue background, each representing a Barcelona neighborhood: Les Corts, Sants-Montjuïc, Sarria-Sant Gervasi, La Barceloneta, Sant Martí, Ciutat Vella, Gràcia, Horta-Guinardó, Nou Barris and Sant Andreu. "Barcelona is a place where football club is absolutely key to people's lives," says Pete Hoppins, senior director of Nike Football Apparel design. 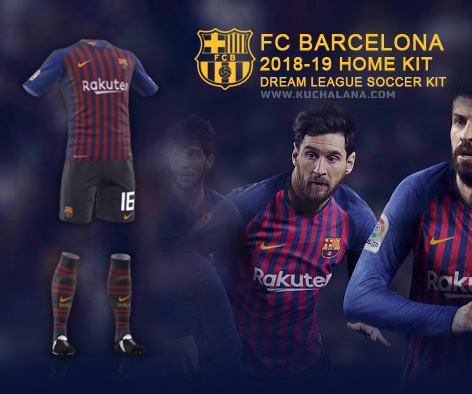 "Iniesta is an icon and a hero to the people who live in these neighborhoods, so I think it's very convenient with the new kit for your last game for the club." The Barcelona 18-19 kit leaves the faded stripes design this year in favor of regular stripes that are much thinner than normal. 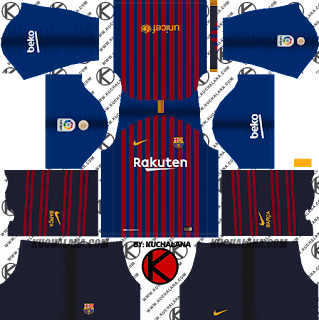 In addition to the stripes, the Barcelona 2018-19 shirt has the same colors as this season and once again uses gold for the Swoosh and white for the sponsors logos. The shirt collar of Barcelona 2018-2019 is navy blue with a Catalan flag detail behind, while the sleeves remain blue as in recent years. Regarding the models, the Barcelona 2018-2019 home kit is based on the same as kits for the Nike World Cup. The next generation of the Nike Aeroswift, shirt template Barcelona 18-19 introduces a new pattern of stitches and a lighter overall construction. 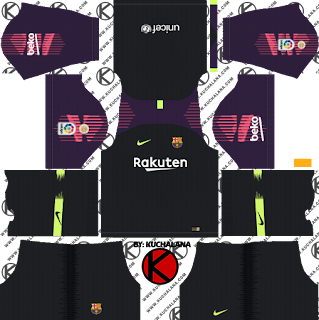 UPDATE : La Liga 2017-18 Champions Badge and brand new Barca 2018-19 Third Kit. 59 Komen untuk "F.C. 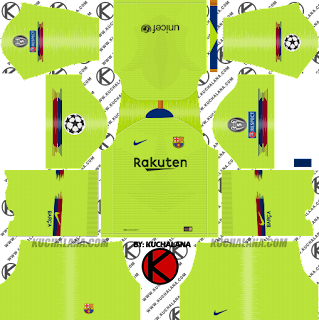 Barcelona 2018/19 Nike Kit - Dream League Soccer Kits"
Can you please remove The kuchalana on the pants? Third nya udh keluar ? Would you please create this one? 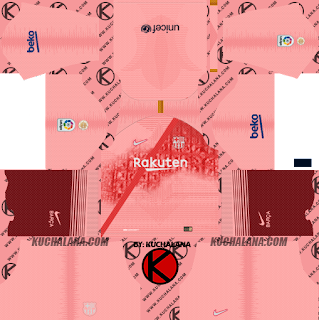 Can you please fix the socks on Barcelona’s third kit, they are light pink not dark pink. Мне 10 лет я болельщик барселоны.Форма круто но есть одна ошибка в третьей форме светло-розовые носки а в это темно-розовые.Каримбаев Довуд. Кунград. Melihat kit ku sufgrfer ya��������. bundle of thanks admin.... i have searches more sites take the F.C. Barcelona kits... but these kits are available your site.